As the Second Avenue Subway’s now-it’s-for-real-we-promise groundbreaking looms, the Times takes a wary walk down memory lane to recall three similar ceremonies in the seventies. A Willie Neuman–narrated video revisits the consecutive groundbreakings at 103rd Street (1972), Canal Street (1973), and 2nd Street (1974). “The line had at least three groundbreakings,” says the author. Oh, at the very least. As Greg Sargent reported in New York three years ago, the first mayoral pickax swing over the star-crossed project occurred way back in 1925, when the mayor was John Hylan. The next time the line came close to reality was 1950, when voters approved a $500 million bond issue to finance it. No pickax action that time: The MTA quietly funneled the money into repairs of existing lines instead. Ten years later, Nelson Rockefeller got involved, which eventually led to the seventies rash of groundbreakings with similar non-results. 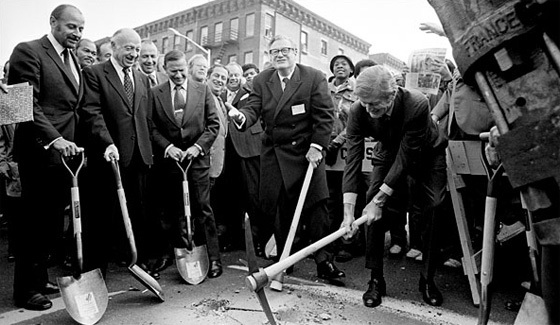 In a bit of ready-made symbolism, Mayor John Lindsay’s swing failed to crack the asphalt in 1972. We’ll see how Spitzer does on Thursday.